Her rock star is waiting in the wings, but will he get a second chance? It’s all change for Sophie Jones—only this time, there is more at stake than just her happiness. Rock star extraordinaire, Dan Hunter, has been her patient and caring friend through the highs and lows since her wedding day, but now he figures it is time for her to start over. By stealth, the rock singer draws Sophie into the behind-the-scenes work for his band’s latest album. 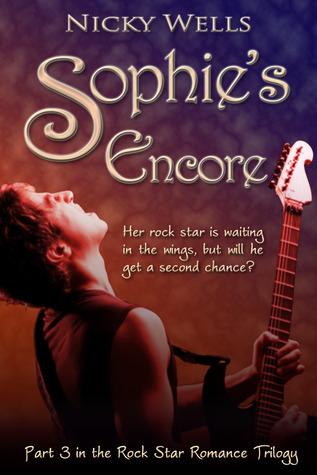 Through the days and weeks spent together at the mixing desk, Sophie discovers whole new horizons for her life, yet before she can even begin to explore them, she faces the very real threat of losing her rock star for good. Nicky Wells is back, and when she came back she came with a bang! Sophie’s Encore is everything we could have hoped for with a little more sprinkled on top. Right from the very beginning I was drawn it. In fact – my jaw hit the table I was sitting at in Costa Coffee. I pulled my phone straight out of my bag and tweeted Nicky “I can’t believe it, you went and ….”. Now if you want to know what she went and did, well then you will have to go and read the book. Be prepared however to be shocked! Anyway as you will see from the description of the book, all hasn’t not remained rosy in Sophie’s garden. The constants in her life though have remained. Dan and Rachel. Dan the man she was in love with once upon a time but who is now one of the people she is closest to and depends on. Rachel her long time best friend and confident. We get to see how the two carry Sophie through her darkest times and how they try to get her to see that her life still has to be lived, regardless if it’s the life she imagined she would be living. Whether it’s the life she wants to be living. We watch as Sophie tries to put her families life back together, and watch on as she refuses to see the obvious and risks losing Dan forever. This is most certainly the most emotional of the three books. Parts of which are quite raw and delve into darker more serious issues than the first two. Beautifully written – of course, we would expect no less and full of intimate knowledge and detail of the music business. A lot of care went into the writing of this series and its telling in its authenticity. While I raced through the book I tried to slow down in the last twenty pages or so as I just wasn’t ready to let go. Two things jumped out at me as I put the book away for the last time. 1 – I think Jodie’s story has to be told. It’s screaming at me from the pages. I think we should petition Nicky Wells to write Jodie’s story – what do ye think? Tanya, thank you so much for fabulous thoughts on Sophie’s Encore. I remember tweeting with you all the while you were reading the book, and it was fascinating and exciting to get your real-time reaction to the story. I’m so happy that the novel captivated you as much as the first two! As for the Trilogy ~ well, it’s a novel in three parts, so it’s definitely over (for now). HOWEVER! This is only the beginning for me. I’m only just getting warmed up! I have a little something for you before the end of the year, and I have my next full-length novel planned for summer 2014. Thanks, as always for your fantastic support. It means the world to be here today, and I hope your readers enjoy meeting me, and Sophie and Dan. Rock on!